You may think of bamboo as that cool looking plant that grows largely in parts of Asia. What you may not know about Bamboo is that it offers a wide variety of applications from construction materials and textiles to musical instruments and of course, linen. It seems somewhat counterintuitive that on one hand bamboo can be used as a solid material in the construction of homes but on the other hand can be turned into a soft, silky fabric that you rest your head on at night. Not only does bamboo offer a more comfortable fabric over cotton, there are also significant environmental reasons for favouring bamboo in the making of bed sheets. Let’s explore. The process of growing bamboo versus growing cotton is much less water intensive. Bamboo requires one-third the amount of water to grow than is necessary for cotton. Bamboo has always been a self sufficient crop that needs no irrigation and uses water much more efficiently than cotton and other trees. 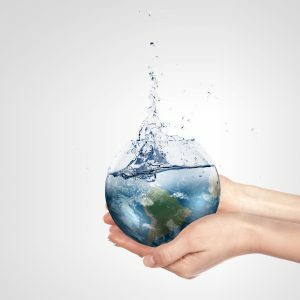 In fact, while bamboo uses only 12 gallons of water to produce one pound of fabric, cotton requires over 200 times more. One of the magical qualities of bamboo is that it rarely, if ever, needs replanting. The plant will almost miraculously sprout on its own with one acre of bamboo yielding 10 times more than one acre of cotton. Cotton requires heavy amounts of harvesting and re-planting each year which can be incredibly labour intensive. 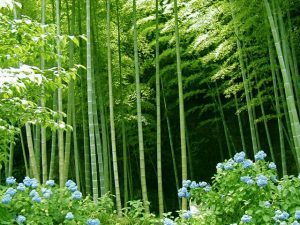 When Japan’s Hiroshima was bombed, Bamboo was the first plant to grow back, bringing green back to the land. Bamboo sticks actually grow incredibly fast. Certain species of bamboo can grow 91 cm (3 feet) within a 24-hour period, a rate of almost 4 cm per hour. The rapid growth of bamboo allows the plant to be fully harvestable within 3-4 years all while replenishing the crop on its own. Stare at plant long enough and you may be able to notice it growing right in front of your own eyes! 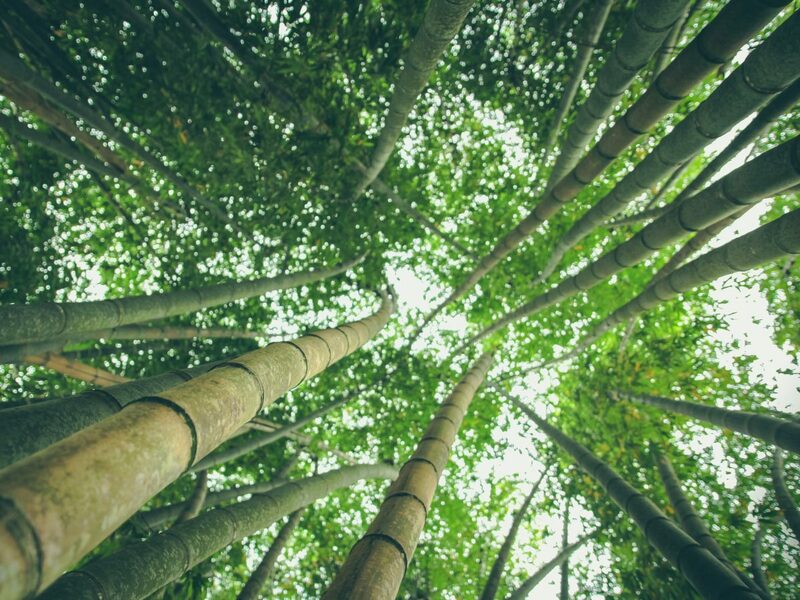 As a result of bamboo’s efficiency in replenishing itself and its rapid growth speed, the plant hardly needs any pesticides or fertilizers to grow. In fact, the roots pull in sunlight and greenhouse gases and convert them into new green growth. Pesticides and fertilizers are used in the production of cotton with 25% of the world’s pesticides and 7% of the world’s fertilizers coming from cotton alone. Cotton may also experience more crop waste where bamboo is naturally resistant to insects or infecting pathogens. Although bamboo is used as a building material and as a higher specific compressive strength than wood, brick, or concrete, it can actually be woven into one of the world’s softest fabric. Viscose from bamboo has been compared to some of the most luxurious fabrics like silk and egyptian cotton but costs much less. Not only is the fabric softer than cotton, but it is also hypo-allergenic and can be worn by anyone without allergic reactions or skin irritation. Whether you use bamboo clothing or bamboo bed sheets, your body emits moisture and sweat onto the fabric. Nothing is more annoying (or distasteful) than lying damp sheets. Bamboo can take in three times more water than its weight and is 40% more absorbent than even the finest organic cotton, wicking moisture away from the skin much faster and keeping you dry and comfortable. Bamboo also contains an useful antimicrobial property called “Bamboo Kun”. This natural antimicrobial bio-agent helps reduce bacteria that thrive on materials and on the human skin. These amazing characteristics help regulate your body temperature, helping you stay cooler, drier, and cleaner at night and creating an exceptional sleeping experience. Now that you’re aware of all the wonderful qualities of bamboo, could you ever imagine going back to sleeping on cotton? Check out some of our incredibly soft bed sheets available in a wide range of colours and sizes and start sleeping on bamboo now!